Chili Master or "Hot Stuff" Award Discounts Apply ! 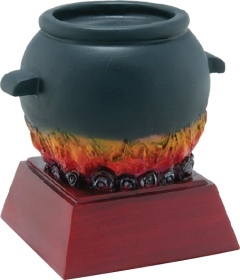 Perfect for chili cook off competitions or someone in your group who is "hot stuff". The resin figure with built-in base has hand painted accents and is attached to our black pedestal base for a total height of approximately 6-1/8". Includes free personalization on a laser engraved plate, or for an additional $5.00, select an engraved brass plate.